We're always looking for obscure holidays to plan our blog ideas. 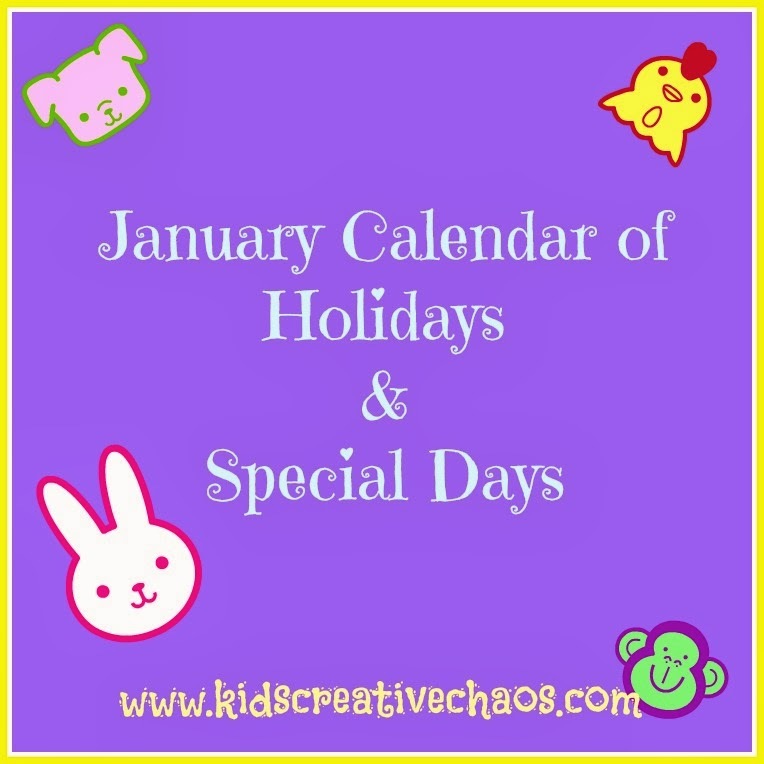 Here is a list of January holidays to theme your classroom boards or craft activities. Scroll down for a free printable January calendar of holidays for the classroom. Enjoy! Pin it! Preschool Scavenger Hunt is full of great theme ideas for special holidays and seasonal activities for preschoolers. Hop over, and check it out. Our Pinterest profile also has ideas for classroom bulletin boards and elementary room doors plus great ideas for homeschooling. No matter the special day, I hope you'll look around my site for more ideas for kids' activities. to plan activities to do with kids. January 1 - while this day is known to everyone around the world as New Year's Day, it is also the birthday of America's beloved Betsy Ross maker of our U.S. flag. (1752) Click for Free American Flag Coloring Page Printables. January 8 - National Clean Off Your Desk Day. Maybe if you tell the kids that, they will find it motivating? January 9 - National Apricot Day. So find some dried apricots or dry your own and make an apricot doll. Wait. They do that with dried apples. Well, do it anyway - invent that! January 10 - Volunteer Firefighter's Day, now that's a good day. It honors some brave folks. How about a little fireman appreciation. Do some crafting with Dalmatians or maybe make some hats or play fireman with an old cut up hose. January 11 - Got Milk? Well, you better get some because today is Milk Day. If you want a really obscure special occasion it is also my parent's anniversary! January 14 - Speaking of dogs, the 15th is Dress up your Pet Day. You could dress your pet up as a Volunteer Firefighter or a Dalmatian; that'd be a hoot. January 14 - Speaking of hoots or birds anyway, It is Bald Eagle Day. Do not dress up your bald eagle today. I repeat, do not dress up your bald eagle today. Have you seen their talons. Yep, this is a bad idea. January 15 - National Hat Day. Hello, I've got some hat crafts. I can help you with that day! Peruse these walls or these frames, you will find many more hats for holidays. January 17 - Ben Franklin's Birthday. How about a fun science project for preschoolers to celebrate. January 19 - It is Archery day. No, kids it didn't start with the Hunger Games, it has been around a long, long, time. Why not paint a bull's eye in color wheel colors so you can learn two things at once. You know, kill two birds with one stone. Ahem. One arrow, I mean. January 20 - Penguin Awareness Day, although Penguins are birds please don't go throwing rocks or shooting arrows at them. You could color a coloring page for the letter P though. January 24 - Global Belly Laugh Day. Celebrate the gift of laughter! 1:24 p.m. (your time) Smile! Throw your hands in the air and LOL for real! January 28 - Daisy Day. I have a Daisy Hat Craft, so you can choose do you use it for Hat Day or Daisy Day? Maybe plant a flower seed instead. 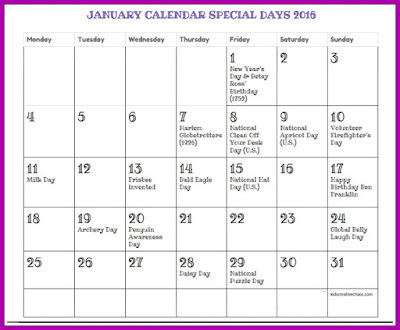 Click here to download: Free Printable January Calendar of Holidays. Add some cool kids' books about snow to your winter activities curriculum. Well, that's all I've got. 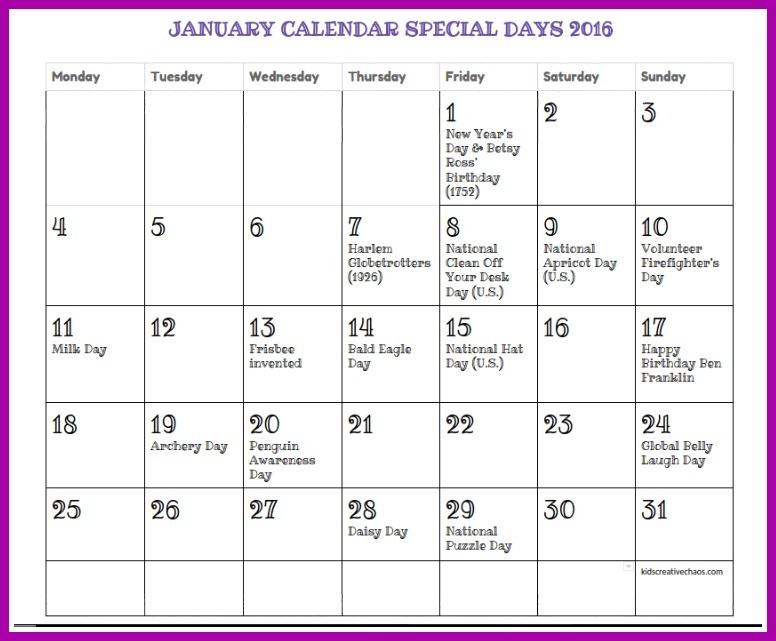 Want some February Special Days ideas? Oh. Try this page for companion coloring pages and free printables - that will help for now. See you back in month!